Fit Family Meal Time into Your Busy Holiday Season! During the upcoming holiday season, I encourage you to make time to enjoy an extra family meal together. Family meals can nourish your mind, body and soul. They provide a great opportunity to enjoy better conversations and strengthen your family ties by spending quality, focused mealtimes together. You can also use family mealtime to encourage good manners and conversations. Not sure how to start a conversation with your children? 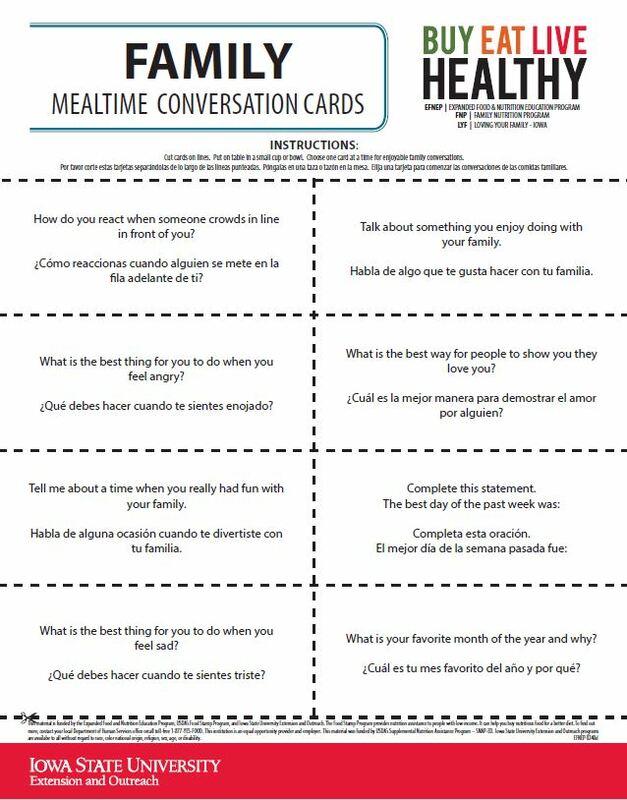 Download these conversation starter cards provided from Iowa State University Extension and Outreach. You will find a variety of topics which are available for teens, families, and children. Did you know that regular family meals create a routine that helps children feel more secure? According to Ruth Litchfield, Ph.D., R.D., Extension Nutritionist, Iowa State University, children who often eat dinner with their families do better in school and have lower levels of stress. Still sound too hard to do? Check out these simple tips to make it easier to have a family mealtime available from USDA’s MyPlate MyWins. Have you tried fixing a crock-pot or skillet meal? Using a crock-pot can help you have that meal ready when you get home. If you do not have a crock-pot, you can try one of these easy and tasty skillet recipes. Add a small salad, fresh fruit and low-fat milk for a quick meal that your family can enjoy together. What tips can you share to make family mealtimes work? Send those tips via the comment section on this blog. As we enter this special week of Thanksgiving, I encourage you to take time to plan and enjoy an extra family meal with your family. Writer: Michelle Treber, Extension Educator, Family and Consumer Sciences, Ohio State University Extension, Pickaway County, treber.1@osu.edu. Reviewer: Marilyn Rabe, Extension Educator, Family and Consumer Sciences, Ohio State University Extension, Franklin County, rabe.9@osu.edu.